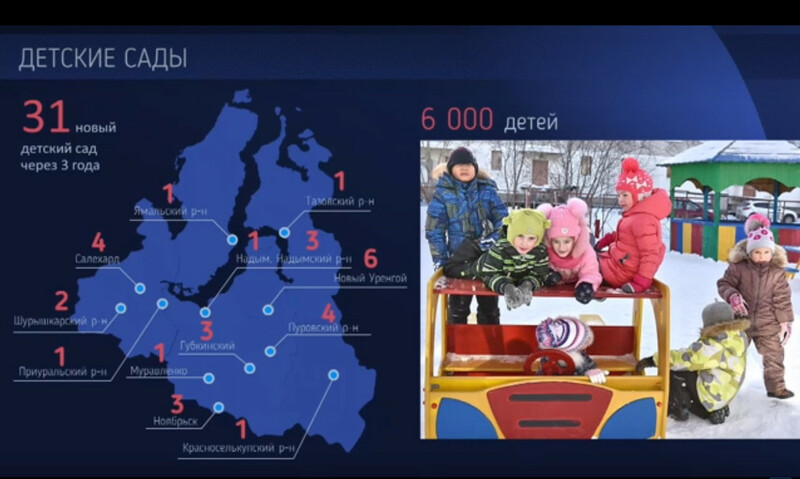 31 kindergartens will be built in Yamal during next 3 years. More than 6 thousand children will go there. During next 5 years 27 new schools will be built. Almost 14 thousand children will study there. The governor of Yamal-Nenets Autonomous Okrug Dmitry Artyukhov stated this in his report on the state of affairs and prospects of development of the region. In the towns Noviy Urengoy, Noyabrsk and Salekhard he announced about appearing of the largest schools in history of the region. In addition, a new big educational institution for 800 pupils will appear in the settlement Tazovskiy. As Dmitry Artyukhov underlines, it is planned strictly to supervise terms and quality of building. “I want to underline, I will strictly monitor compliance with terms and quality of building process. Those, who would not manage, will bear responsibility. We are ready to act decisively — I think many have already noticed this”, as the governor noted.